The Yamaha BB series basses were designed purely with rockers in mind. Delivering high resonance sound, rock solid hardware and unique build methods that all add up to make this a highly popular bass played by the likes of James Lomenzo, Glen Hughes, Tony Kanal and Duff McKagan. Now for 2017 this new range of BB 5 string basses are here to celebrate 40 years of success and bring with them the excellent sound and build quality you'd expect. The Yamaha BB235 5 String Bass Guitar is crafted from Alder, a very popular wood for bass production owing to it's fundamental ability to produce a smooth, deep tone whilst remaining lightweight and comfortable to play, ideal for a 5 string model. The alder body is then treated using Yamaha's exclusive A.R.E. seasoning process. This delivers an incredibly smooth and mature sound whilst enhancing the natural resonance of the body. The BB235 Bass Guitar features a neck composed with maple and garnished with a smooth satin finish so that you can glide up and down the neck all night without discomfort. The combination of the maple and satin finish also delivers silky smooth tone and bright highs and ensures that the neck BB235 Bass Guitar doesn't warp over time. The combination of a split single-coil bass in the middle position and a single bar pickup in the bridge position means that you can capture full-bodied sound that can also be controlled carefully. Smooth, driving bass right through to hard hitting, punchy slap bass lines can all be easily achieved with the BB235 owing to the independent volume controls and master tone control. 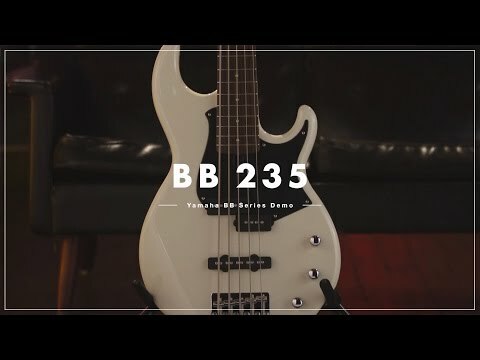 The BB235 Bass employs a vintage style bridge that works in complete harmony with the lightweight, open geared tuners to deliver rock solid tuning and deep sustain. For those that need a 5 string bass that means business, the Yamaha 2017 BB235 40th Anniversary Bass Guitar has got your back.